took to world record-breaking in 2004 after being inspired by a record-setting rally driver in Kenya. What began as a hobby soon escalated into an active publicity pursuit. Today, he promotes the work of social and environmental causes. For these purposes, the most fitting game plans are chosen; then world titles are attempted and frequently created. Behind every world record attempt is the expertise of professionals in their field. This is the story behind my Guinness World Record™ for the Most AA batteries held in the hand. Putting AA batteries in my hand wasted a lot of my time. I practised and I tried repeatedly to beat the existing world record holder over a period spanning more than a month. It was a painfully slow process, learning how to hold batteries in my hand. The effort started long before I was able to take a seat and try placing the things in my open hand. Although I had the option to buy cheap AA batteries, I chose to spend the time to look for old, used ones. So I walked into toy and model shops, light engineering shops and the like, asking for batteries out of their rubbish bins, until I had nearly 50 flat ones. I know the easier way is to buy new ones, but apart from the cost, buying new would be the wasteful option. I proved that by finding dozens upon dozens of used batteries in shops across my part of the city. So if you’re thinking of trying this, please spare a thought for plants and animals which will have discarded batteries thrown out in places they grow and live unless you use your batteries thoughtfully. Pick them second-hand and then recycle them as the American Government recommends. Cool! Anyway, once I’d begun practising and having tried and failed nearly 120 times, I felt that if I gave up without succeeding, I would indeed have failed. So I kept trying. Whether that’s the hallmark of a stupid person or a determined goal-setter is for you to decide. But I could not tolerate the thought of having spent dozens of nights trying to accumulate little batteries in my hand if I’d never receive any recognition for it. So, like a certain battery brand, I was determined to keep on going, night after night. I’d sit at my desk, lay out all the required gadgets for evidence collection, and set the timer counting down. With whisking movements of my thumb and index finger, I’d move one battery at a time from the bowl into my palm, as fast as I could. Often, though, I was working so fast that I’d miss a battery by reaching for it and sending my fingertip several millimetres too far. And then, because my brain would be operating faster than my fingers, I’d lose the rhythm and drop a battery. That would be the end of the attempt. I knew I had approximately 0.67 of a second to complete my cycle time, at least 43 times in quick succession to beat my competitor. My receiving hand needed to be kept level and steady because the batteries slid off one another so easily. I needed to switch my focus from hand to hand as fast at the individual batteries were moved. I needed to place each battery in a specific position so there’d be enough space for the next. And if I missed one of the highly coordinated moves, it was all over; I would need to repack the batteries and start again. Just a momentary mistake would put my hand movements out of synchronisation and there would be no point in continuing due to lost milliseconds. Getting it right was a tough call, which is why it took me so long to succeed! Some days I looked at the bowl of batteries with envy. Why was I unable to get this but someone else could? Each time this negativity entered my head, I confronted myself mentally: I took the bowl in hand, sat down and tried the world record a number of times. Each and every attempt left me a failure. Then, just before Christmas Day, I sat down once more with the bowl in front of me. I sighed. I rested my forehead on the table and shut my eyes. And I inhaled very deeply. I hated these batteries. Working with them was becoming one of the most difficult world records I’d tried to break to date. I wanted these batteries out of my life and in the recycling – where they belong. And, like the batteries, I was energised. No matter what, I had convinced myself that I’d win the battle over second-hand batteries which won’t cooperate for a world record. Within seconds, I’d got to work. And much to my delight, the attempt started off well. I didn’t drop a single battery and by the time I had placed several dozen in my hand, I was feeling confident. Perhaps too confident. Right then, I slipped and a battery spun through the air, over the bowl and onto my lap. But I was determined to end this irritating game in which the batteries always beat me. So I continued. And when the timer sounded, I had – I could hardly believe it – succeeded! What a relief. It came as such a surprise to me that I could actually defeat these horrible batteries. Next I sighed audibly and at length. This, I was hoping, would be the end of me versus a bowl of nasty, slippery little batteries. All I needed was to receive a result from the world record judges, and I’d know for sure. That result came shortly after. It was positive. I had triumphed over a bowl of second-hand AA batteries which had made me into a temporary battery-holding failure. But now I was the king and master over these batteries and it was a lovely feeling. 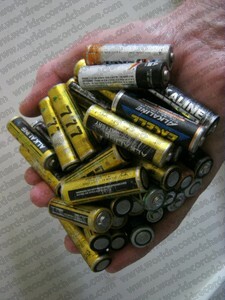 So, off to the recycling station it was, with my unwanted batteries in a bag. This would be the last time these tricky items and I would spend the day together, because, from now on, they’d be taken care of by a recycling facility. Serves them right, the uncooperative little beasts! As for me, well, I’m happy. This is yet another world record I can add to my growing list. Next, I’ll be off to the charity shops to seek out more items for more world record attempts. It’s what keeps me active. I love it. Alastair Galpin is an independent world record breaker. He is not aligned with, nor does he represent, any world record system. World record-breaking, Sponsor world records, Storytelling, Photo licensing, Raising awareness. All content © A. Galpin unless specified. No content may be used without prior written consent.